There is something mystical about the Karoo light. In summer the landscape shimmers beneath the relentless sun, the hills and thickets a quantum image seemingly fixed only in your mind’s eye. Amanda and I are perched on a hill near Middleton, a sculptured geological model of the towering flat topped mountains 50km further north. We are on one of nine birding sites that we monitor for avian activity as part of an EIA process for the many wind farms proposed to meet South Africa’s “Green Energy” commitments. Gazing down at the flickering landscape on a terrace below us, a solid movement catches our eye. A procession of dogs is climbing over a predator proof fence 1500m away. They are a motley mixture of breeds and sizes led by a Jackal hunter through the shades of blue grey that comprise the Karoo flora. The eleventh dog, smaller than the rest becomes agitated as the pack proceeds down the slope, while the hunter, disinterested in the plight of the separated dog, steps onto the jeep tracks and follows the leading dogs. In the searing heat of midday the leading dogs focus is not on Jackals or Caracul, but on a nearby dam and the promise of refreshing water to both cool and quench from their morning endeavours. The hunter seemed intent only on returning to his home for lunch, oblivious to the dogs fanning out through an Acacia thicket n the trail of some scent. Finally the abandoned dog succeeds in climbing over the fence and dashes to the water as the rest of the pack move off after the hunter before they are engulfed by the chimera of the Karoo mirage. Not for the first time, I pondered the futility of lethal small predator management amongst livestock farmers, particularly in the Karoo. Sure, I have met farmers that have been frustrated by the loss of up to 100 lambs in a season. I have also listened to the complaints from farmers that they “have to” spend up to three hours on four nights a week hunting Jackal or Caracul, resigned to the fact that they will miss out on the scarce commodity of a farmers sleep. Recently I even met Kobus, a helicopter pilot, who has a company specializing in eradicating Jackals, hunting them from the air. Not a cheap option, his services are booked up a year in advance, testimony to the extent of desperation some sheep farmers feel in the perceived onslaught of stock predation. On the flip side of the lethal predator management debate, David Shearing went to court to defend his right not to hunt small predators. Yes, it was every farmer’s legal obligation in South Africa to destroy small predators before he retired from farming. Mr Shearing had the admirable distinction of being the first small stock farmer to not be sentenced for not destroying small predators on his farm. There is also Mr Kingsley of the Victoria West district and Petrus from Kareedow who are proudly “Predator Friendly” farmers, all whom advocate the merits of actually retaining predators on their farms and how it assists in maintaining a healthy flock. So what is their secret? Why do they feel that instead of eradicating small predators, they invest in ensuring their future? In essence it comes down to management and using predators as a natural measure of the condition of their vegetation. Predators as a measure of the condition of grazing you may well ask. Time travelling back to my 8th grade, my folks shipped me off for my autumn vacation to family friends, Jenny and Norman Kroon, who farm sheep in the Aberdeen and Graaff Reinet district in the Karoo. I recall that 5 week vacation with clarity, the allure of ranch style farming to play a major role in sculpting my future aversion to urban life. Mostly, I recall the profound difference in the condition of the veld on the Kroon’s farm compared to their neighbour. One farm road in particular followed the boundary between the two properties in excess of 8km. Driving along that road, as we frequently did to check on the condition of the sheep or to dose them, the road stretched to the horizon, a double tracked buffer between two landscapes. 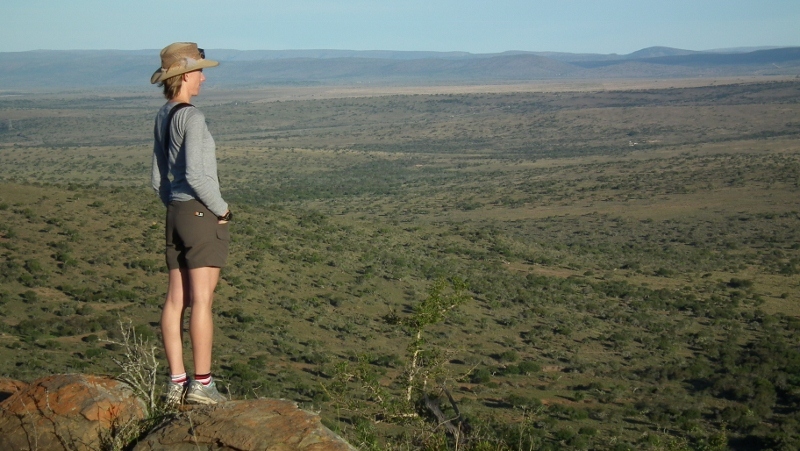 To the west was lush Karoo veld, to the east was barren exposed soil sparsely dotted with random bushes. The contrast between the condition of the sheep on the respective properties was equally as stark. Thin, lethargic sheep to the east, lively plump sheep to the west. The difference was a holistic paradigm. Norman, when he started farming, researched literature for accounts of the famed Springbok migrations prior to the era when the Karoo was fenced off for sheep ranching. With this information he implemented a rotational grazing program that best emulated the former natural migrations across his property and in doing so, retained the species diversity of the veld which provided a high level of nutrition for his stock. With this branded in my memory, meeting David Shearing was a further inspiration in appreciating how harnessing nature in sheep ranching has numerous benefits. In his court case he could provide documented evidence that in excess of 20 years of ranching his direct loss of sheep to small predators was a paltry 25 lambs. Marginally more than one lamb per year. A considerable difference to claims by other farmers of more than 100 lambs per year. So, what does he attribute his ranching success to? Rabbits! Well, the rare Riverine Rabbit to be precise. I addition to being a sheep rancher, David is also a leading authority on the flora of the Karoo and has published books on the flora of this diverse semi-arid region. One of the things he noticed in the early stage if his ranching was the floral transformation of the Karoo marked most noticeably by the proliferation of the Acacia karoo. A pioneer species, it colonises unstable and degraded regions, nature’s way of stabilizing a disturbed landscape. To the astute farmer, the proliferation of Acacia sp also indicates in part the chronic degradation of the veld due to over grazing. In addition, it is an indicator that a component of the natural food web is absent. In this case it was the gradual population collapse of the Riverine Rabbits which graze on the newly germinated Acacia’s. David’s solution was to facilitate conditions that ensured a stable population of rabbits. The long term benefits of this program were twofold. Firstly, it ensured that there was ample natural food for the small predators. Secondly, and more importantly, it ensured a stable ecology with the resultant food source for his sheep. While it is convenient to manage the veld, what role do the predators play in the management of the veld? Jackals and Caracul are territorial, both species patrolling a home range dependent on the landscape and actively repelling any competitors that attempt to hunt on or contest their territory. Mr Kingsley used to be a rancher that hunted small predators as a means of control against lamb losses. That was until his teenage son implored him to stop the lethal method and employ a non-lethal means. During his research he opted for a combination of using poison collars during lambing season and management of established pairs of Jackals and Caracul throughout the year. Retired now, he is steadfast in the success of his approach, proud that the loss of lambs to direct predation was almost negligible for the last phase of his ranching. Indeed he maintains that his maintenance of particularly the Jackal pairs in their territories played a major role reducing lamb loss. On retiring neither of his sons expressed an interest in farming, so he sold his farm. 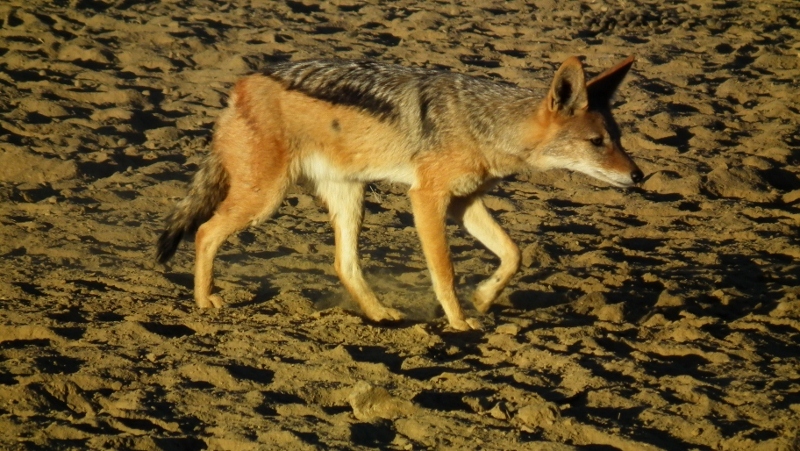 While handing over his property to the new farmers, they were amazed at the large population of both Jackal and Caracul, noting that they would have to invest plenty time into eradicating them. Mr Kingsly implored them to leave the predators alone and warned that if they started killing them they would suffer stock losses. Disbelieving his advice, they started eradicating Jackal and subsequently suffered severe stock losses and in the process disturbing the balance that he had created for over a decade. It is only the aged and injured small predators, which in the absence of natural prey, will hunt domestic species. Jackal in particular teach their young how to hunt as well as which species to hunt. By ensuring a healthy natural prey population and managing predators that refrain from hunting livestock a farmer can save a considerable amount of time and expense wasted on hunting small predators. Other factors to consider are reproduction and fecundity in wild species which are often stimulated by a high rate of hunting. As hunting pressure increases, the fecundity rate of both species increases proportionately. A farmer in the Klaarstroom district related how the number of Caracul that he kills has increased threefold in the past 15 years. This is hardly surprising considering that with sustained hunting litter size will increase from one to three successfully raised young . In addition to the increased fecundity, there is the selection for, or the breeding of the “Super Jackal” with increased hunting pressure. Devious by nature, stealthy and wary, Jackals that survive lethal management programs are the elite of their species and pass on their successful attributes to their progeny creating a future of larger litters and super successful survivors. In the past year we have spent approximately two weeks a month sitting on many farms monitoring birds. At the same time we have had the chance to observe farms and livestock. Most remarkable, similar to the distinct contrast in veld condition between Norman’s farm and his neighbour, we are astounded at the variation in stock condition between neighbouring farms. Skinny listless sheep with dung smeared loins stare across the boundary fence at plump healthy sheep, the seven strands of barbed wire not the only component responsible for the disparity in their condition. At lambing season we have observed dead lambs have lain strewn in the veld. In the mornings we have seen dead sheep dotted in the veld where the afternoon before they were feeding, noticeably in poor condition. Of the carcasses we have checked, none have shown evidence of predation, though later in the day we do witness scavenging by raptors and ravens. So, is it merely convenience for farmers to attribute stock losses to predation instead of facing up to reality that poor husbandry and disease is responsible for the bulk of stock losses? On a project in the Pantanal in Brazil I assisted in a Earthlife project assessing what percentage of stock deaths were caused by Jaguars. A survey of farmers in the region had attributed 100% of stock losses to Jaguar predation. With the introduction of a compensation program instigated by Conservation International, each carcass was inspected for evidence of predation and scavenging. Samples were also collected for pathology testing. Within a year of this program a survey of the ranchers returned response with less than 10% livestock loss attributed to Jaguar. The primary cause of stock loss was disease, a fact which the ranchers were quick to recognise once it was demonstrated to them.. The most holistic approach to sheep ranching that I have encountered has been Petrus. Amanda and I were part of a group of cyclists touring between Kareedouw and Biviaans Kloof. On the way to our overnight camping spot we passed a farm with a notice board proclaiming that the farm was a Leopard friendly farm. That evening, one of the support crew, Petrus, was preparing dinner over a searing fire. BBQ lamb chops that tasted of Karoo herbs, chicken wings seasoned with a secret family recipe. Succulent gourmet food greatly appreciated by 12 ravenous cyclists. Later, closing in on the fire to repel the winter chill, I mentioned the notice board and enquired if any of the support crew knew the onwer. Petrus eyed me cautiously, then hesitantly asked what my interest was before stating that it was his farm. His caution was due to the fact that he had recently been featured on a local TV documentary which created publicity that he was not prepared for. Chatting further I mentioned that we had seen a herd of Mountain Reedbuck in a pasture, a species that are normally seen in remote hills removed from regular human activity. That was the ice breaker. The Reedbuck were his pride and joy and my noticing them gained me his confidence. In short, he had previously shot anything that moved on his farm. He suffered stock losses, production was down, Jackal and Caracul seemed to be a plague targeting him specifically. Then two incidents occurred, his health took a turn for the worse and the communal Jackal hunter died without a replacement. When he recovered a few months later and could get back into the veld he noticed that the antelope, Duiker and Bushbuck, as well as the Bushpig were moving around his farm, following the fresh plant growth in different regions. Changing his normal grazing program, he rotated his sheep to follow the antelope. Analysis of the antelope dung had shown him that the quality of plant material consumed was of a higher than where his sheep had been grazing. Simultaneously he also noticed that predation of his sheep had dropped down to negligible level. The consequence was that he decreased from destroying in excess of100 Caracul per year to less than five Caracul per year, only shooting old and injured individuals when they started hunting his sheep. Of predation from Jackals, he claimed that he had not had any losses in a few years. He knew and monitored his population of small predators, knowing from tracking when new animals entered the established territories. Ultimately, both the natural prey species and the small predators became an integral component to monitoring the health of his grazing with the enhanced production of his livestock. When the antelope moved out of an area he responded by moving his sheep out as well. In the event that a sheep was killed by a Caracul, instead of rushing out to kill it, he took it as a second natural warning that it was time to shift his flock to new grazing. 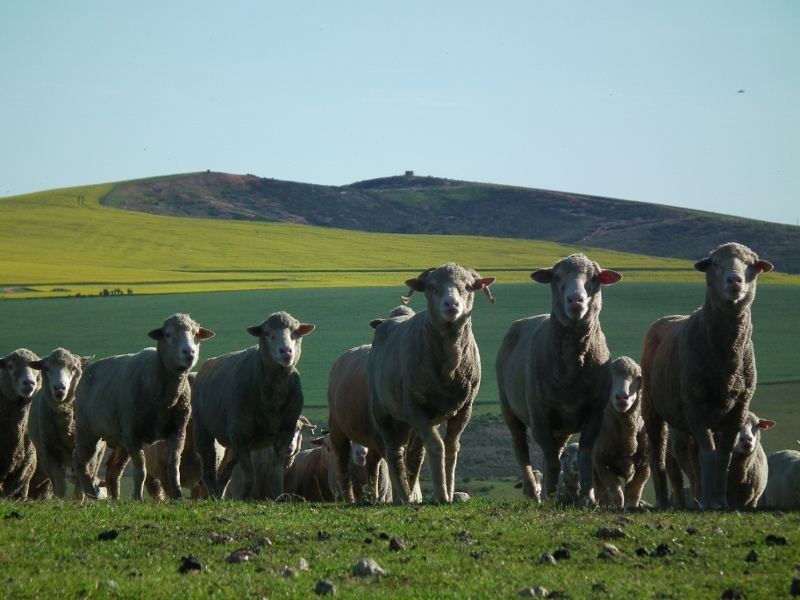 Considering that small livestock farming in South Africa is primarily ranching, it is imperative for farmers to consider the entirety of their practice. Unlike feedlot or pasture producers, it is the condition of their veld which determines the success of their production. Without the cost of feeding, is loss of 10% lambs/annum a significant loss? What if a true audit of sheep ranching included accountability for the custodianship of the natural environment that is utilized for agricultural production? Would the loss of10% or less warrant the ruthless destruction of some crucial apex predators? Agriculture has dramatically transformed the environment on which it depends during the past century. The challenge of food security into the future requires that established methods of ranching husbandry be re-evaluated and a healthy sustainable alternative be implemented, not only for the success of the farmer, but for the healthy balance of the environment.